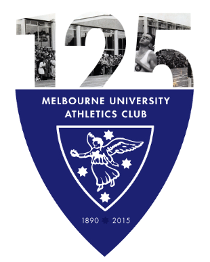 Melbourne University Athletics Club has carried its’ good form into the second half of the season, with another good effort from the Shop team. The competition, on Saturday, 28th of November, at the Newport track began as usual with a win by Paul Kennedy in the 3000m walk. Kat Sutton went stride for stride all the way to the line to come 2nd in the 800m in a pb (2:25.58). Lauren Jauncey continued her good form with 2nd in the 200m (24.93). 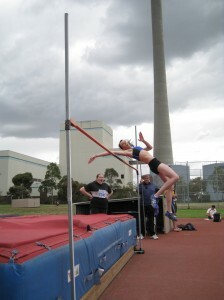 Julian O’Donnell came second and Jannelle O’Sullivan won the high jump as the came out for their first competition of the year. Jordan Mayston ran well to record his first sub 2 minute 800m of the season and come second. Kath Iannello stepped up for the team and gave the hammer a couple of spins before hurling it a respectable 12.92m. Hamish Beaumont recovered sufficiently from Thursday night’s 5000m to win the 3000m in 9:05. The ladders (after round 6) find MUAC in a qualifying position in all five open teams. Round 8 is on Tuesday, 1st of December, 6pm at Aberfeldie.